Indications associated with the coating variations of the crimson (red-purple) tongue body. a. damp heat with injury to the body fluids. Intestine. This tongue coating covers entire tongue. It is thick, dry, and rough. deep red tongue body can be observed. greasy a. body fluids deficiency with damp-heat steaming up. The tongue coat looks wet, but feels sticky when touching it. b. excess heat in the middle burner with turbid phlegm. but is not actually a coating. then attacked by wind cold. The red tongue prior to the attack. b. ext. 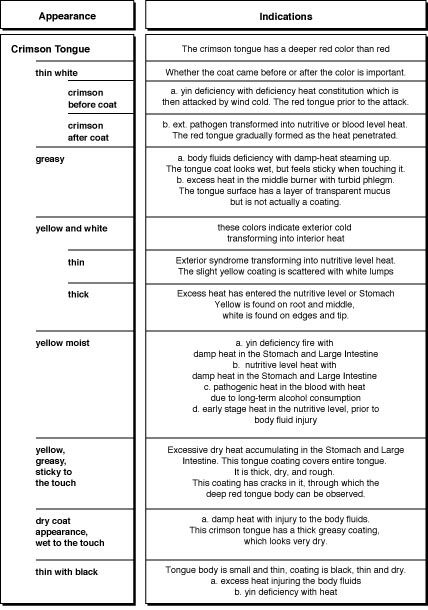 pathogen transformed into nutritive or blood level heat. The red tongue gradually formed as the heat penetrated. Whether the coat came before or after the color is important. white is found on edges and tip. Exterior syndrome transforming into nutritive level heat.